The restored rerelease floats back into theaters 50 years after its birth as an intergenerational Beatles favorite. James Corden's recent, instant classic "Carpool Karaoke" with Paul McCartney started with a phone call plea: "Can you please, please help me?" It's not the first time the key question from "Help!" turned up as a Beatles punchline. 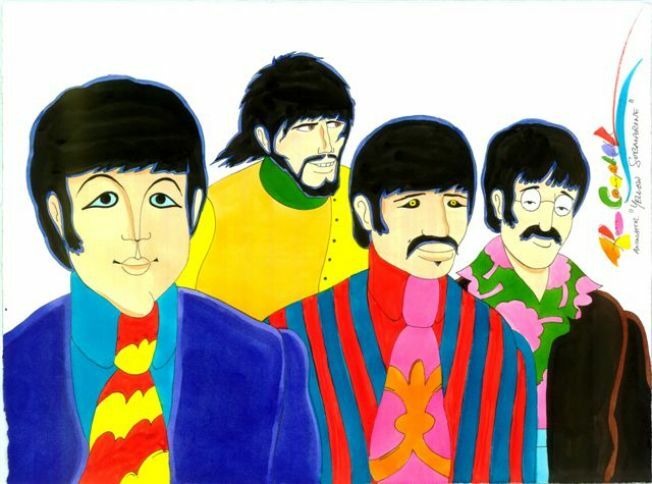 In the 1968 animated film "Yellow Submarine," Old Fred warbled those lyrics when seeking Fab Four assistance in saving Pepperland from the Blue Meanies. The answer then and a half-century later remains the same: yeah, yeah, yeah! A restored version of "Yellow Submarine" resurfaced this week for a golden anniversary rerelease. The theatrical return bodes to take the Corden sing-along experience from the car to the moviehouse. We're in the midst of another great year in a decade filled with Beatles 50th anniversaries and new ventures. A deluxe version of 1968's "White Album," complete with demo recordings, is in the works. McCartney, who turned 76 last month, recently released two strong songs ("Come On To Me" and "I Don't Know") ahead of an album set for September. Ringo Starr, currently on tour, marked his 78th birthday July 7 in France with his 10th annual worldwide "Peace & Love" celebration. Corden's 23-minute magical history tour through Liverpool with McCartney stands out as an unexpectedly affecting experience – for the CBS host, for the music great and for those of us who have helped rack up more than 25 million YouTube views of the segment since June 22. McCartney visited his last boyhood home for the first time since leaving town as a Beatle with Starr, John Lennon and George Harrison. He played a surprise gig in a local pub and visited the barber shop in Penny Lane. He sang with Corden, whose tears while belting the soundtrack of his life with one-quarter of greatest band of them all, no doubt, were shared by many viewers. The “Carpool Karaoke” special edition played, in some respects, as even more fantastical than "Yellow Submarine," the trippy, Pop Art gem that floated into theaters all those years ago. The film offered surprises of its own, via the surreal, yet accessible animation. The Beatles' voices were supplied by actors, save for the flesh-and-blood cameo coda. But the band's music propels the action, from the kid friendly title tune to the visually stunning "Eleanor Rigby" sequence to the words-to-live-by anthem "All You Need is Love." It's a good bet Corden, born a decade after the flick's original release, will catch the frame-by-frame restoration along with others who embrace the Beatles' knack for bringing people together across generations through shared love of the music. That's the kind of help we all could use.